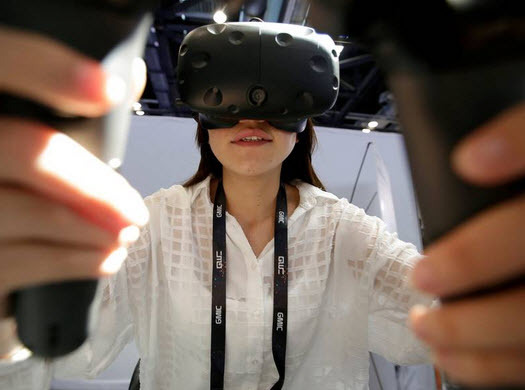 Christopher Mims’ WSJ column argued today that all this VR hype is about to crash. I tend to agree with his assessment. VR is over-hyped (except for the gamers, for which it is like Christmas morning every week). However, for main street, VR will be a brief curiosity for years to come, despite efforts by IMAX and many others. Mims’ argument is that VR hardware is progressing nicely but VR content is woefully lacking, remaining as glitzy demo-ware. He gives several parallels from past technology waves, like early TV and the recent 3D TV. The VR developers, like Oculus and HTC, are generously funded studios to generate VR content. However, the creation of a healthy self-sustainable business segment for VR content is still years off. Mins predicts that “disappointment will continue until 2018 or so …for mainstream consumers”. In his personal experimentation with leading VR headsets, Mims confirms “the astonishing long-term potential of VR…which literally left me wobbly in the knees”. He states that the key is the illusion of “presence” which is “a trick reliably induced by placing a person virtually on the precarious edge, staring down at a vastness with nothing to prevent you from falling into it”. He continues, “Presence is easier to achieve in games, because many offer full freedom of movement and interactivity”. He implies that mainstream VR content will require more years of maturity to create production pipelines, creative talents, best practices, productive tools, and hearty market segments. Mins assessment is sobering and should be heeded by the IA community. The message is… Do not hype the VR part of immersive analytics! We should focus on building immersive data worlds that demonstrate tangible value for normal people (shsss…which by the way happens to use some VR technology). A deeper point is that IA has the opportunity to fill this current VR content deficient. Think of a constantly updated info-graphic, except you immersively walk into it. It is data-driven and engaging via creative design and cleaver software. Once the software and design is developed, the info-graphic would continue to generate constantly changing VR content attracting people long-term. For instance, take a rich useful data stream (like weather, Wikipedia, financial markets, terrorism), build a well-designed immersive data world, and offer it as a public cloud service. The data world should blend current and historical data, along with custom interactive analytics to drill deeply into any aspect. Wrap the data world in a social collaboration layer (like Pinterest for data enthusiasts) so that people can share insights …and get excited about the insights of others. This is like… Qlik/Tableau/Spark meets Oculus/Hive/StarVR on a dark and stormy night. What will emerge from the shadows? Let’s build it and see! Please share your comments at our IA group on LinkedIn.